A humble, but true, statement from the Anaheim Ducks forward who continued to bat .1000 at the charity ping-pong tournament by taking home top honours for the fourth consecutive year in the players' tournament champion. Created by Moore and supported by the NHLPA, Smashfest continues to outdo itself by growing its efforts to help support awareness and research into concussions and rare cancers. With Smashfest VII, the tournament hit a record-breaking $200K raised from the night as part of one of the most unique charitable experiences, which has now raised over $865,000 to date. 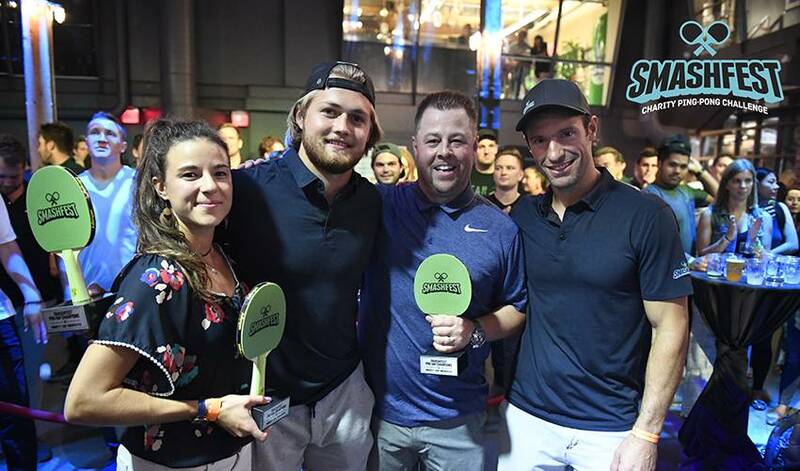 Coming in all the way from Sweden for the event, William Nylander made his Smashfest debut a success by winning the Pro-Am tournament in what came down to a nail-biter between his team and Malcolm Subban’s of the Vegas Golden Knights. Joining Moore at Smashfest were over 20 current and former NHL players, including Josh Anderson, Connor Brown, Travis Dermott, Vince Dunn, Eaves, Scott Harrington, Zach Hyman, Sam Gagner, Doug Gilmour, Josh Leivo, Mitch Marner, Brandon Montour, Steve Moore, Nylander, Brett Ritchie, Nick Ritchie, Devin Shore, Dylan Sikura, Jeff Skinner, Gemel Smith, Dylan Strome, Malcolm Subban, Brandon Tanev, and Chris Tierney. Smashfest VII joined forces with one of Canada’s foremost concussion research labs through a collaboration between The Steve Moore Foundation and Dr. Arthur Brown and his associates, at the Schulich School of Medicine & Dentistry, Western University to explore certain types of brain cell activity post traumatic brain injury. “This support from Smashfest and The Steve Moore Foundation will help us start a new study focused on understanding how acute changes after concussion can trigger a cascade of events in the brain that lead to cognitive decline decades later,” said Dr. Brown. This newly announced research project will look into the action of a naturally-occurring enzyme that phosphorylates tau. The plan is to investigate, in a model of head injury, whether inhibiting that enzyme may be associated with reduced levels of the harmful tau, and in turn lead to reduced pathology in the brain and better cognitive performance in the longer term. The new collaboration will take early steps towards finding answers about employing the brain's own resources to prevent harmful tau alterations from occurring. The first question will be about how and why hyperphosphorylation occurs, and what can be done at the cellular level to prevent it. Last year, Smashfest supported The Broad Institute of Harvard and MIT, a research laboratory that plays a key role in revolutionizing the study and treatment of rare cancers, and its Cancer Cell Line Factory. The project has aimed to create resources to accelerate the study and treatment of rare cancers. Smashfest has supported the Broad Institute's efforts to establish a research platform that, when systematically applied, could empower researchers around the globe who study these diseases. With another successful year in the books, Smashfest only continues to grow as the $1M mark looks closer than ever. For more information on Smashfest and to keep up-to-date on tickets for SmashfestVIII, visit smashfest.ca.